Tate's crispy, thin chocolate chip cookies are available in single serve packages and make the perfect anytime snack! 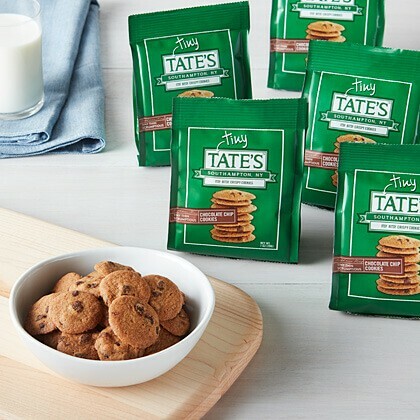 Tuck a bag of Tiny Tate’s - a bite sized version of our famous chocolate chip cookie - in a lunch box, workout bag, or briefcase for a great anytime snack. Each case contains two, 12-packs for a total of twenty-four, 1 oz bags. My daughter and her friends love these!!! A great find for road trips and between sports events. Will be looking for more in my area. Goodness in a small bag! Found these on Malstrom AFB, MY and fell in love. Went back to buy more-- they were gone! Found more in Spokane at Fairchild AFB, I was happy again, and bought 4 of each. I hope to r nd a Colorado source soon. If not, this website will save me. These are so good! Great size and perfect flavor!! Satisfies your sweet tooth as well as your spirit! My husband first found Tiny Tates at a Bed Bath and Beyond store. He bought four bags, I was in the hospital and he brought them to me. They were worth getting well! And, then going on a search to buy more! Of course the store was out! I went on line to find them. Finally found this web site. OMG - they are so good! I try to only eat one bag at a time, but sometimes will have two. Satisfies your sweet tooth as well as your spirit! So very good! These tiny bits of deliciousness are perfect for traveling, after school snacks, or anything on the go! Just amazing!!! Awesome snack! I saw these minis at Stop & Shop in Fall River, MA. I swear I bought half of the minis before they were all gone. I was so upset that all they sell now is the big packs! So I decided to look them up because they taste that good! My boyfriend thinks I’m crazy but OMG they are soooo amazing! So glad you added this small package of chocolate chips to your brand. Perfect little take along snack, and late night craving snack. You can enjoy the whole tiny bag! Absolutely delightful little morsels of heaven!